Growing up in NYC gave us an opportunity to enjoy multicultural cuisines. The diner was one of my favorite places to grab a quick bite to eat. There was a diner in almost every neighborhood. Their menus was endless. Most of the diners in Brooklyn were owed by Greek proprietors. One of my favorite dishes on the menu was the Chicken Souvlaki. So delicious. My niece, Christine, was kind enough to share this recipe that she got her hands on. Christine is not only a great cook but she also grows her own veggies including the cucumbers that she uses in the Tzatziki sauce. Way to go, Chris! Boneless chicken breasts cubed. Marinate them overnight in olive oil, oregano (a good amount), garlic, fresh lemon juice, S&P. 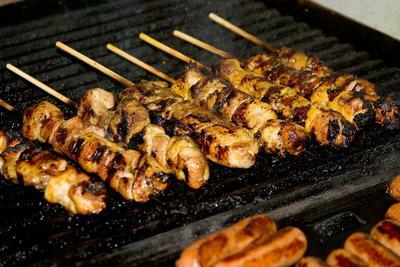 Place on skewers and grill until cooked through. 2 small containers(6 oz) of FAGE Greek yogurt. 1 cucumber peeled & grated. Put grated cucumber in a strainer and salt. Let the water drain from cucumber. Squeeze every last drop of water from that cucumber, watery Tzatziki is bad Tzatziki. 1 clove garlic, either minced or put through garlic press whichever is easier for you. Me? I did the garlic press. who has time to mince a clove of garlic? Palm full of minced fresh dill. Blend all ingredients. Add a tiny bit of olive oil to give the yogurt mix a smoother texture(very little is needed). Add a dash of white vinegar( 1/4 tsp) S&P to taste. Let chill for a few hours. I usually make this in the morning so it’s super cold and cucumber flavor really takes off. Side dish? Grilled veggies fresh from the garden. Serves about 4-6 people. The Tzatziki will keep for a few days in the fridge. It’s delicious on hamburgers, grilled pork and lamb as well.